CW (a.k.a. Cambridge Wireless) held a very interesting event titled 'Time for Telecoms' at the Science Museum in London. I managed to record this one talk by Prof. Andy Sutton, who has also kindly shared slides and some other papers that he mentions in his presentation. You can also see the tweets from the event on Twitter. The video playlist and the presentation is embedded below. Tommy Cook & Tim Frost: Stepping up to the Challenge on Tighter Time Accuracy. 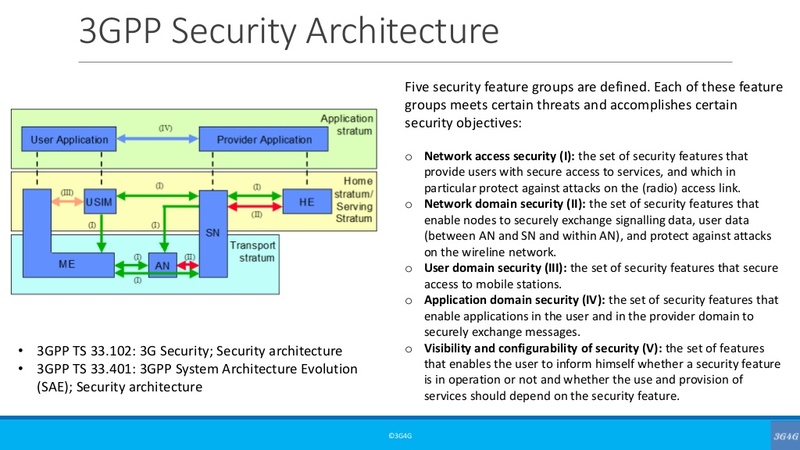 I recently did a small presentation on 3GPP Security, looking at the how the security mechanism works in mobile cellular networks; focusing mainly on signaling associated with authentication, integrity protection and ciphering / confidentiality. Its targeted towards people with basic understanding of mobile networks. Slides with embedded video below. You can also check-out all such videos / presentations at the 3G4G training section. 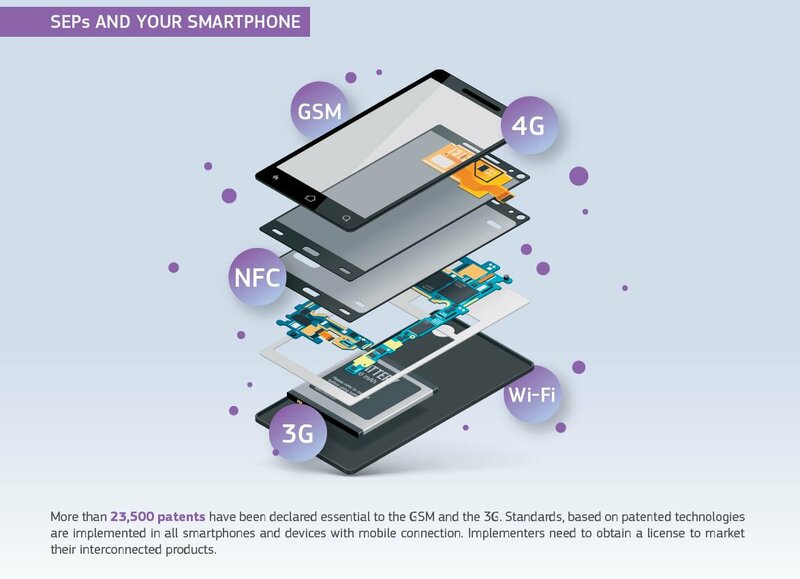 More than 23,500 patents have been declared essential to the GSM & 3G as shown in the picture above. I am assuming this includes 4G as well. Anyway, its been a while I looked into this subject. 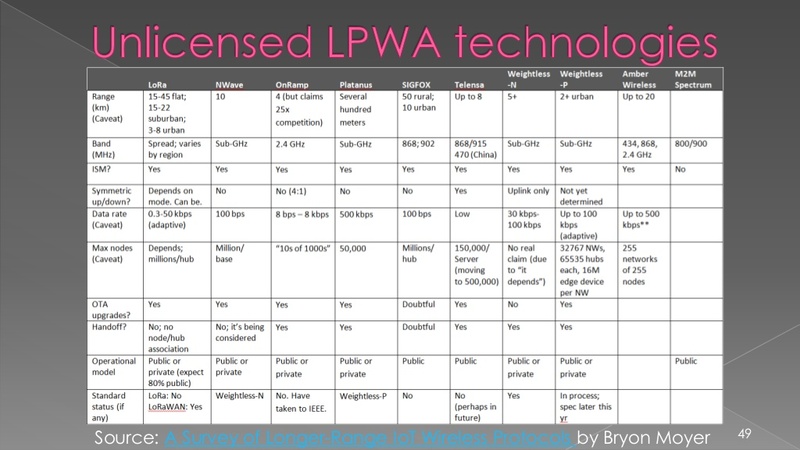 The last time I was looking, 4G patent pools were beginning to form. For LTE, indeed there is no one-stop shop for licensing. The only company that has tried is VIA Licensing, with their patent pool, but they don’t have licenses for the big players like Ericsson, Qualcomm, Huawei, ZTE, Samsung, etc. The same will probably apply for 5G. This old picture and article from Telecom TV (link) is an interesting read on this topic. This official WIPO list shows ZTE, Huawei, and Qualcomm at the top of the list for international patent filers worldwide in 2016 [PDF]. (Can't recall the source for this one) In March, Ericsson announced plans to license 5G for $5 per device and possibly as low as $2.50 in emerging markets. In November, Qualcomm announced plans to license 5G IP at the same rates established by the NDRC for 4G/LTE phones sold into China: 2.275% for single mode essential patents / 4.0% for the entire portfolio or 3.25% for multimode essential patents / 5.0% for the entire portfolio. All rates are based on the wholesale price of the phone. Qualcomm also announced that the previously undisclosed $500 price cap will apply to all phones. Qualcomm also announce a rate of less than $5 for 5G for automotive applications and $0.50 for NB-IoT based IoT applications. Ericsson has filed patent application for its end-to- end 5G technology. Ericsson has incorporated its numerous 5G and related inventions into a complete architecture for the 5G network standard. 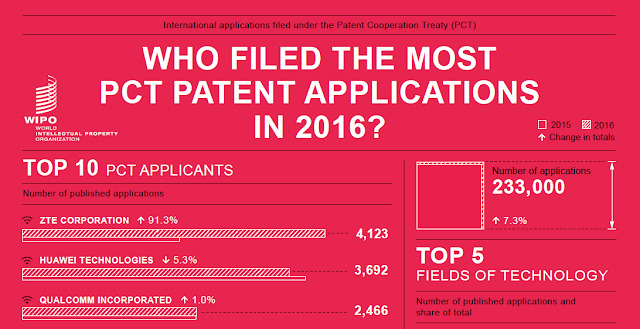 The patent application filed by the leading telecom vendor combines the work of 130 Ericsson inventors. Dr. Stefan Parkvall, Principal Researcher at Ericsson, said, “The patent application contains Ericsson’s complementary suite of 5G inventions.” Stefan added, “It contains everything you need to build a complete 5G network. From devices, the overall network architecture, the nodes in the network, methods and algorithms, but also shows how to connect all this together into one fully functioning network. The inventions in this application will have a huge impact on industry and society: they will provide low latency with high performance and capacity. This will enable new use cases like the Internet of Things, connected factories and self-driving cars.” Ericsson is involved with leading mobile operators across the world for 5G and Pre-5G research and trials. The patent application is likely to further strengthen its position in the 5G race. More details on E/// 5G patents on their official website here. Mobile world live has some good details on Qualcomm 5G NR royalty terms. Smartphone vendors will have to pay as much as $16.25 per device to use Qualcomm’s 5G New Radio (NR) technology under new royalty guidelines released by the company. Qualcomm said it will implement a royalty rate of 2.275 per cent of the selling price for single-mode 5G handsets and a higher rate of 3.25 per cent for multi-mode smartphones with 3G, 4G and 5G capabilities. So for a $200 multi-mode device, for instance, Qualcomm noted a vendor would have to pay $6.50 in royalties per device. Royalties are capped at a $500 device value, meaning the maximum amount a smartphone vendor would have to pay would be $16.25 per handset. The company added it will also offer access to its portfolio of both cellular standard essential patents and non-essential patents at a rate of 4 per cent of the selling price for single-mode devices and 5 per cent for multi-mode devices. Qualcomm’s rates are notably higher than those announced by Ericsson in March. The Swedish company said it would charge a flat royalty fee of $5 per 5G NR multimode handset, but noted its fee could go as low as $2.50 per device for handsets with low average selling prices. The official Qualcomm 5G royalty terms [PDF] are available here. 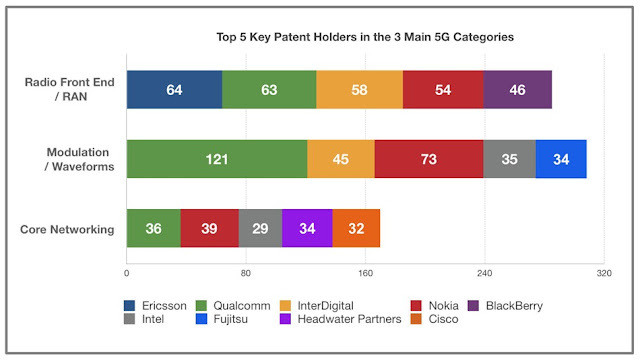 Thanks to Mike Saji for providing inputs on 4G patent landscape. Thanks to Keith Dyer for interesting tweets on this topic. Here is a quick tutorial on mobile network sharing approaches, looking at site/mast sharing, MORAN, MOCN and GWCN. Slides with video embedded below. If for some reason you prefer direct link to video, its here. Looking back at my old post about UMTS & LTE (re)selection/handovers, I wonder how many different kinds of handovers and (re)selection options may be needed now. 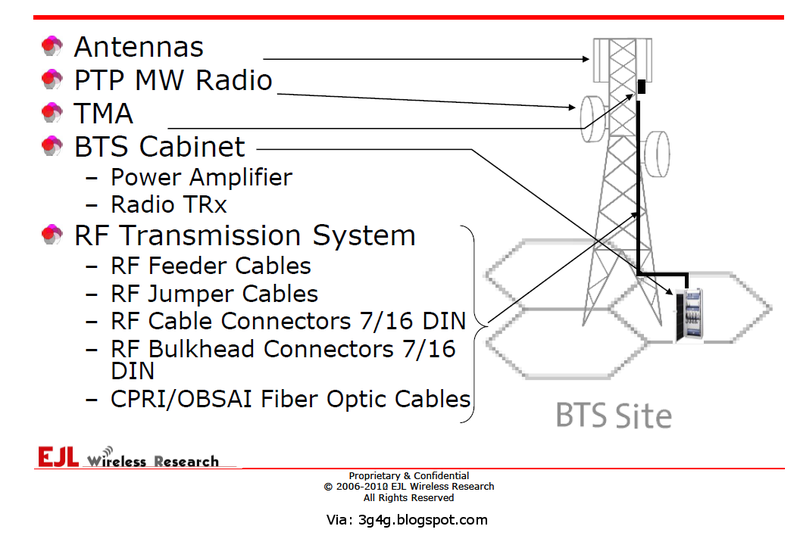 In another earlier post, I talked about the 5G specifications. This can also be seen in the picture above and may be easy to remember. The 25 series for UMTS mapped the same way to 36 series for LTE. Now the same mapping will be applied to 38 series for 5G. 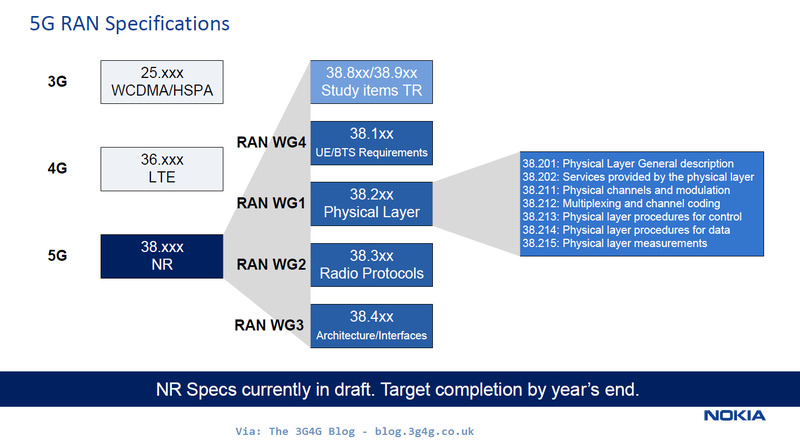 RRC specs would thus be 38.331. 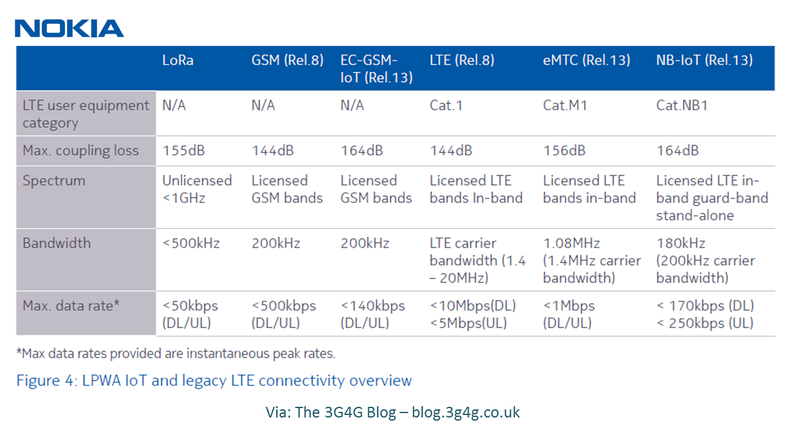 A simple comparison of 5G and LTE RRC states can be seen in the picture above. As can be seen, a new state 'RRC Inactive' has been introduced. The main aim is to maintain the RRC connection while at the same time minimize signalling and power consumption. Looking at the RRC specs you can see how 5G RRC states will work with 4G RRC states. There are still for further studies (FFS) items. Hopefully we will get more details soon. - access to a 5G core network via GERAN or UTRAN. 2G/3G switch off is always a topic of discussion in most conferences. While many companies are putting their eggs in 4G & 5G baskets, 2G & 3G is not going away anytime soon. Based on my observations and many discussions that I have had over the past few months, I see a pattern emerging. In most developed nations, 2G will be switched off (or some operators may leave a very thin layer) followed by re-farming of 3G. Operators will switch off 3G at earliest possible opportunity as most users would have moved to 4G. Users that would not have moved to 4G would be forced to move operators or upgrade their devices. This scenario is still probably 6 - 10 years out. As we all know that 5G will need capacity (and coverage) layer in sub-6GHz, the 3G frequencies will either be re-farmed to 4G or 5G as 2G is already being re-farmed to 4G. Some operators may choose to re-balance the usage with some lower frequencies exchanged to be used for 5G (subject to enough bandwidth being available). On the other hand, in the developing and less-developed nations, 3G will generally be switched off before 2G. The main reason being that there are still a lot of feature phone users that rely on 2G technologies. Most, if not all, 3G phones support 2G so the existing 3G users will be forced onto 2G. Those who can afford, will upgrade to newer smartphones while those who cant will have to grudgingly use 2G or change operators (not all operators in a country will do this at the same time). 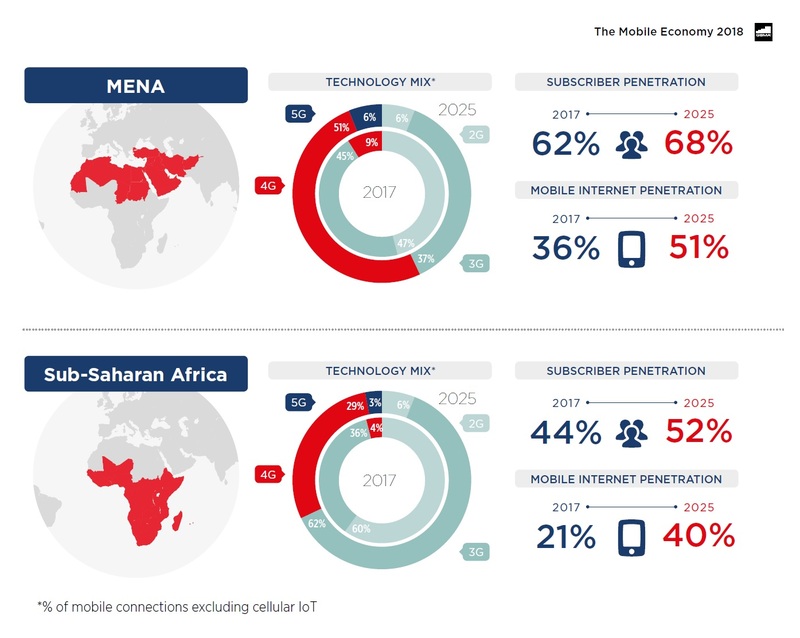 Many operators in the developing countries believe that GSM will be around until 2030. While it may be difficult to predict that far in advance, I am inclined to believe this. For anyone interested, here is a document listing 2G/3G switch off dates that have been publicly announced by the operators. In January 1985 the UK launched its first mobile networks. 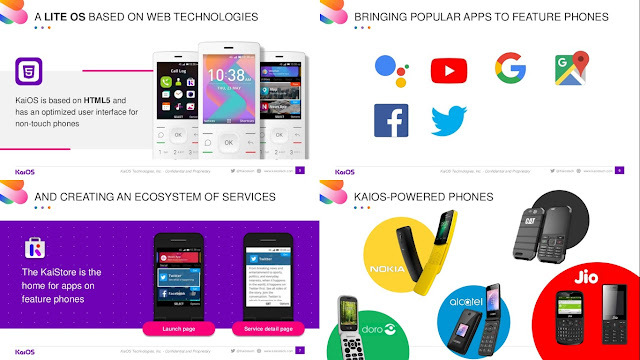 Now, thirty years on, many people and companies in the UK have been celebrating this enormous achievements and advances that have been made since then and which have seen the mobile evolve from a humble telephone into the multimedia pocket computer which has become such an essential part of modern life. 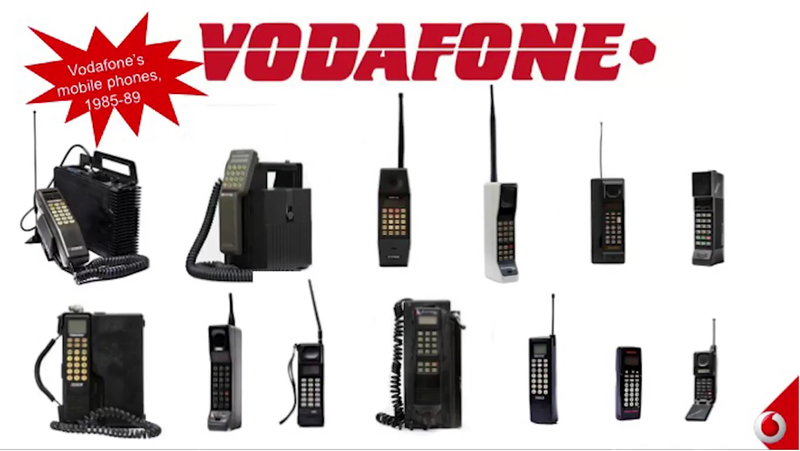 It was simply not possible in 1985 to envisage a country that would be able to boast more active mobile phones than people or to have along the way clocked up several world firsts, and be now leading on the deployment of 4G and shaping the future 5G technologies. 9. 4G and onwards to 5G – Professor Andy Sutton, EE and University of Salford. If you have any facts to share, please feel free to add in the comments below. In the good old days when people used to have 2G phones, they were expensive but all people cared about is Voice & SMS. The initial 3G phones were bulky/heavy with small battery life, not many apps and expensive. There was not much temptation to go and buy one of these, unless it was heavily subsidised by someone. Naturally it took a while before 3G adoption became common. In the meantime, people had to go out of their way to get a 3G phone. 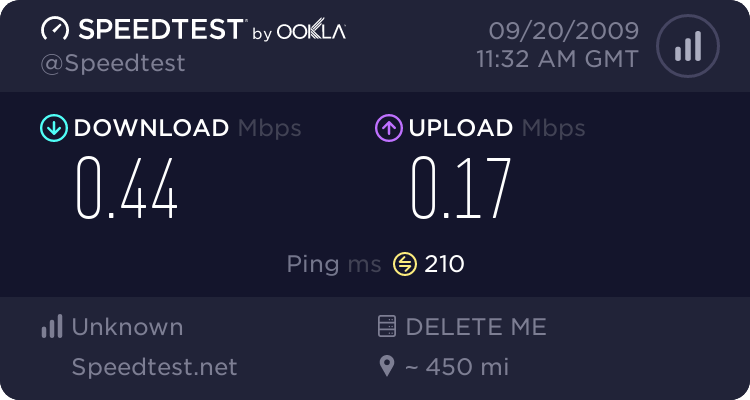 With 4G, it was a different story. Once LTE was ready, the high end phones started adding 4G in their phones by default. What it meant was that if the operator enabled them to use 4G, these devices started using 4G rather than 3G. Other lower end devices soon followed suit. Nowadays, unless you are looking for a real cheap smartphone, your device will have basic LTE support, maybe not advanced featured like carrier aggregation. With Huawei in Istanbul for a 4.5G event. Apparently there are 40 million 4G subscribers 1 month after LTE launch (by all 3 MNOs). This is what I refer to as 4G or LTE by stealth. 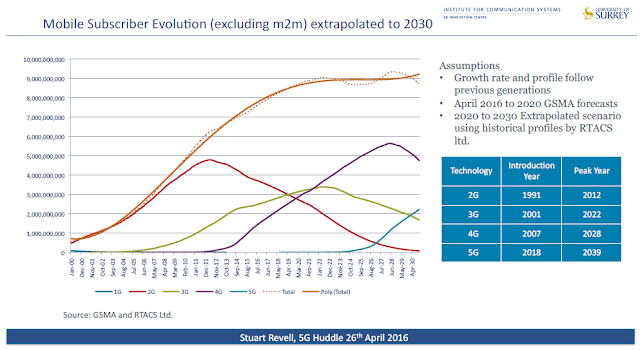 Occasionally people show charts like these (just using this as a reference but not pin pointing anyone) to justify the 5G growth trajectory with 4G in mind. 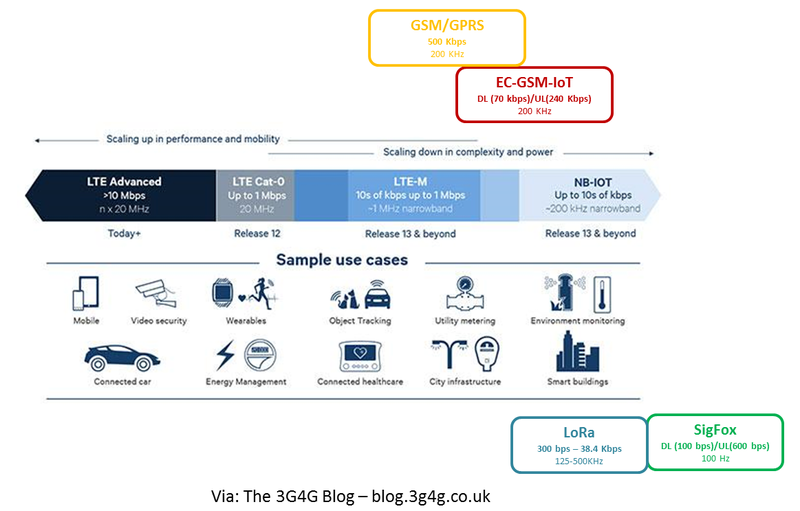 It will all depend on what 5G will mean, how the devices look like, what data models are on offer, what the device prices are like, etc. I think its just too early to predict if there will be a 5G by stealth. 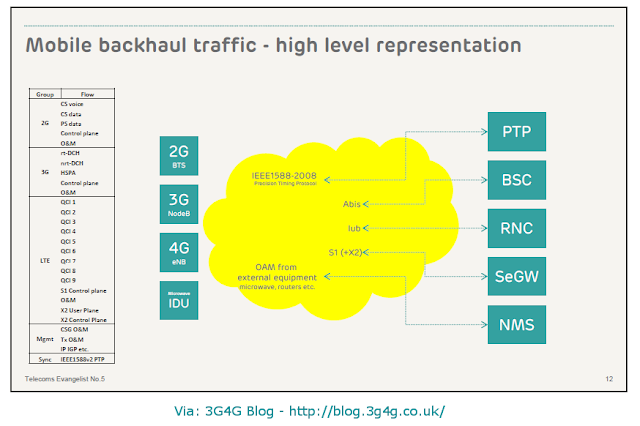 Interesting to see in the above that the LTE traffic in the backhaul is separated by the QCI (QoS Class Identifiers - see here) as opposed to the 2G/3G traffic. This is EE's implementation. As you may notice 2G and 4G use SRAN (Single RAN) while 3G is separate. 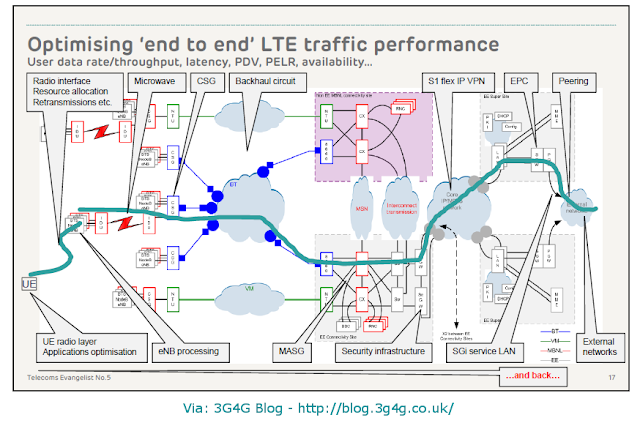 As I mentioned a few times, I think 3G networks will probably be switched off before the 2G networks, mainly because there are a lot more 2G M2M devices that requires little data to be sent and not consume lots of energy (which is an issue in 3G), so this architecture may be suited well. Finally, a practical network implementation which looks different from the text book picture and the often touted 'flat' architecture. Andy did mention that they see a ping latency of 30-50ms in the LTE network as opposed to around 100ms in the UMTS networks. Mark Gilmour was able to prove this point practically. M2M is going to be big. With the promise of 50 Billion devices by 2020, the networks are already worried about the overloading due to signalling by millions of devices occurring at any given time. To counter this, they have been working on avoiding overloading of the network for quite some time as blogged about here. The feature to avoid this overload is known as Extended Access Barring (EAB). For E-UTRAN, in Rel-10, a partial solution was implemented and a much better solution has been implemented in Rel-11. For GERAN a solution was implemented in Rel-10. The following presentation gives a high level overview of EAB for E-UTRAN and GERAN. In Rel-11, a new System Information Block (SIB 14) has been added that is used specifically for EAB. 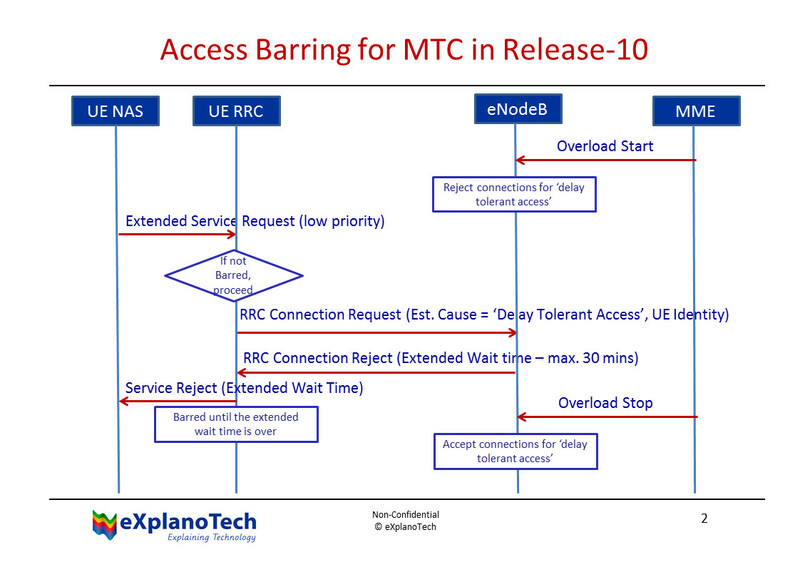 Whereas in Rel-10, the UE would still send the RRCConnectionRequest, in Rel-11, the UE does not even need to do that, thereby congesting the Random Access messages. 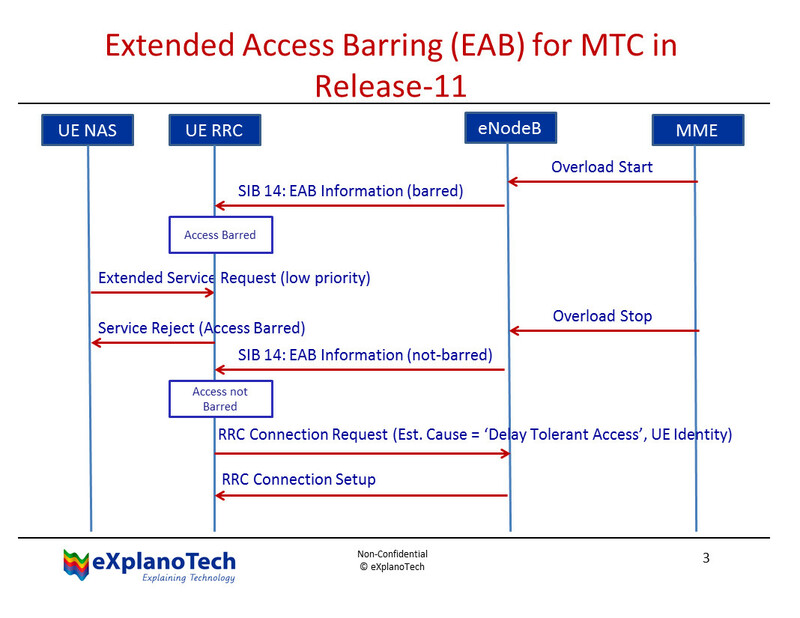 The IE SystemInformationBlockType14 contains the EAB parameters. 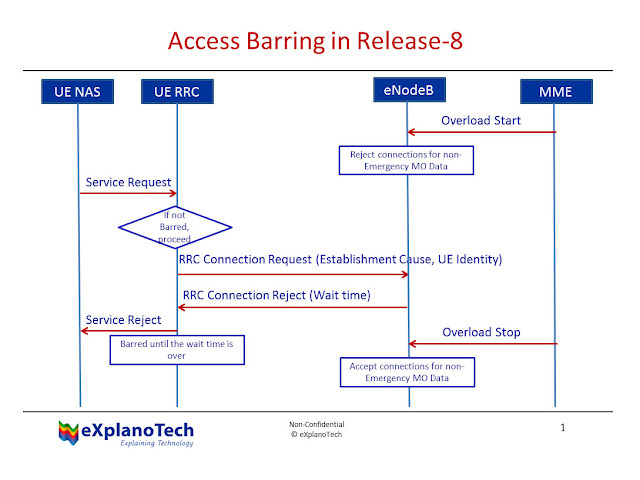 Extended access class barring for AC 0-9. The first/ leftmost bit is for AC 0, the second bit is for AC 1, and so on. Indicates the category of UEs for which EAB applies. Value a corresponds to all UEs, value b corresponds to the UEs that are neither in their HPLMN nor in a PLMN that is equivalent to it, and value c corresponds to the UEs that are neither in the PLMN listed as most preferred PLMN of the country where the UEs are roaming in the operator-defined PLMN selector list on the USIM, nor in their HPLMN nor in a PLMN that is equivalent to their HPLMN, see TS 22.011 . The EAB parameters applicable for all PLMN(s). The EAB parameters per PLMN, listed in the same order as the PLMN(s) occur in plmn-IdentityList in SystemInformationBlockType1. Here is my attempt to explain the difference in overload control mechanism in Rel-8, Rel-10 and Rel-11. Please note that not actual message names are used. As usual, happy to receive feedback, comments, suggestions, etc. 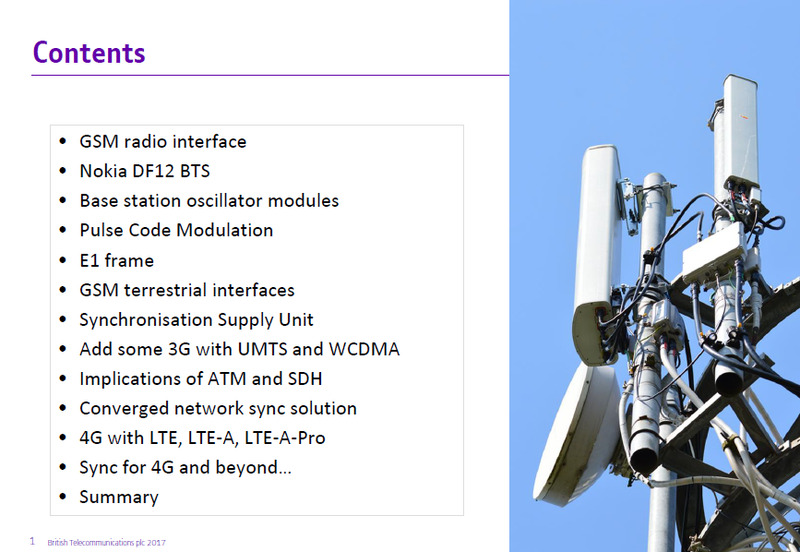 Here is a presentation from NSN about 20 years of GSM and since they had the privilege of launching the first commercial network I am sure they have a good reason to celebrate. A new section on 3G4G website on GSM has been added here. Network Operation Mode I (NMO-I) is used when the Gs interface is present. In this case during the registration a Combined Attach (includes GPRS Attach & IMSI Attach procedures) procedure can be performed. A GMM Attach Request message with the attach type set to Combined Attach is used. Upon completion of this procedure, MM Status is IMSI Attached and GMM State is Attached. In Network Operation Mode II (NMO-II) the GS Interface is not present. So the GMM attach procedure and the IMSI Attach (via Location Update) has to be performed seperately. This causes additional signalling. Basic air interface signalling in case of NMO2 is shown here. Network operation mode 1. A network which has the Gs interface implemented is referred to as being in network operation mode 1. CS and PS paging is coordinated in this mode of operation on either the GPRS or the GSM paging channel. If the mobile device has been assigned a data traffic channel then CS paging will take place over this data channel rather than the paging channel (CS or PS). Network operation mode 2. The Gs interface is not present and there is no GPRS paging channel present. In this case, paging for CS and PS devices will be transferred over the standard GSM common control channel (CCCH) paging channel. Even if the mobile device has been assigned a packet data channel, CS paging will continue to take place over the CCCH paging channel and thus monitoring of this channel is still required. Network operation mode 3. The Gs interface is not present. CS paging will be transferred over the CCCH paging channel. PS paging will be transferred over the packet CCCH (PCCCH) paging channel, if it exists in the cell. In this case the mobile device needs to monitor both the paging channels. 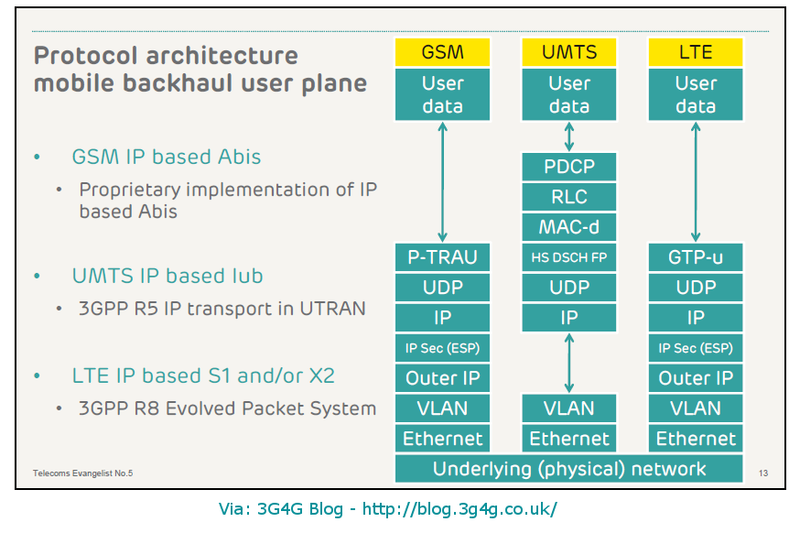 The GERAN part above is extract from the book Convergence Technologies for 3G Networks. During an ongoing GPRS / EDGE data transfer (TBF established), mobiles can't detect incoming voice calls and SMS messages as they are focused on receiving packets and thus can not observe the paging channel. In NMO-1, the circuit switched part of the network forwards the paging message to the packet switched side of the network which then forwards the paging message between the user data blocks while a data transfer is ongoing. Mobiles can thus receive the paging message despite the ongoing data transfer, interrupt the session and accept the voice call or SMS. Location/Routing area updates when moving to a cell in a different location/routing area are performed much faster as the mobile only communicates with the packet switched part of the network. The packet switched network (the SGSN) then forwards the location update to the circuit switched part of the network (to the MSC) which spares the mobile from doing it itself. This is especially important for ongoing data transfers as these are interrupted for a shorter period of time. Cell reselections from UMTS to GPRS can be executed much faster due to the same effect as described in the previous bullet. Whithout NOM-1 an Inter RAT (Radio Access Technology) cell reselection with Location and Routing Area update requires around 10 to 12 seconds. With NOM-1 the time is reduced to around 5 to 6 seconds. An important difference as this reduces the chance to miss an incoming call during the change of the radio network. Also, ongoing data transfers are interrupted for a shorter time,an additional benefit that should not be underestimated. Presented by Stéphane Téral, Principal Analyst, Mobile and FMC Infrastructure, Infonetics Research in the 1st Self-Organizing Networks Conference, 30th Nov and 1st Dec. 2010 at the Waldorf Hilton. 3GPP has been working on Energy saving initiatives for Release-10 and Release-11. Here is a very quick summary of some of these items. Most mobile network operators aim at reducing their greenhouse emissions, by several means such as limiting their networks' energy consumption. In new generation Radio Access Networks such as LTE, Energy Savings Management function takes place especially when mobile network operators want e.g. to reduce Tx power, switch off/on cell, etc. based on measurements made in the network having shown that there is no need to maintain active the full set of NE capabilities. By initiating this Work Item about Energy Savings Management, 3GPP hopes to contribute to the protection of our environment and the environment of future generations. The objective of this technical work is to study automated energy savings management features. 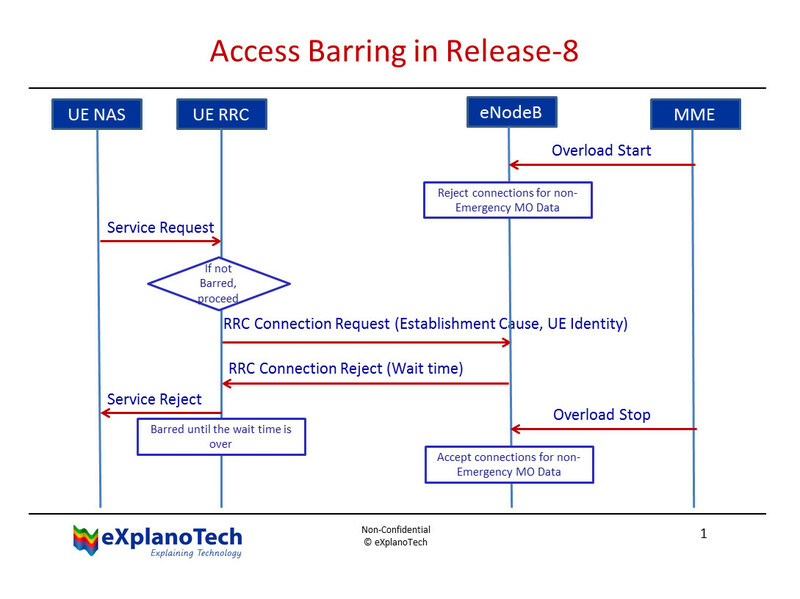 Usage of existing IRPs is expected as much as possible, e.g. Configuration Management IRP, etc. However, this technical work may identify the need for defining a new IRP. 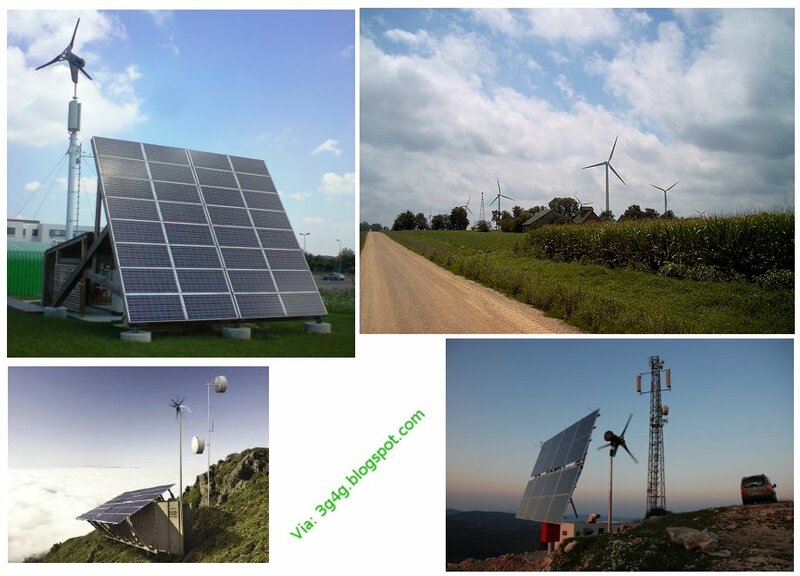 There are strong requirements from operators on the management and monitoring of energy saving functions and the evaluation of its impact on the network and service quality. Therefore an efficient and standardized Management of Energy Saving functionality is needed. Coordination with other functionalities like load balancing and optimization functions is also required. • Select existing measurements which can be used for assessing the impact and effect of Energy Saving actions corresponding to above Energy Saving use cases. • Define new measurements which are required for assessing the impact and effect of Energy Saving actions, including measurements of the energy consumption corresponding to above Energy Saving use cases. Energy Saving (ES) mechanisms are becoming an integral part of radio networks, and consequently, of mobile networks. Strong requirements from operators (for reasons of cost and environmental image) and indirectly from authorities (for the sake of meeting overall international and national targets) have been formulated. With the expected masses of mobile network radio equipment as commodities, in the form of Home NB/eNBs, this aspect becomes even more crucial. • mass effects in signalling potentially endanger the network stability and need to be handled properly. It is unclear whether and how currently defined procedures are able to cope with, and eventually can be optimized for, ES conditions; thus a systematic study is needed. The study shall also evaluate and give recommendations on potential enhancements to 3GPP specifications (whether and where they are seen necessary). Due to the need to reduce energy consumption within operators’ networks, and considering the large amount of UMTS network equipment deployed in the field around the world, the standardisation of methods to save energy in UMTS Node Bs is seen as an important area of study for 3GPP.There has not been a large amount of focus on energy-saving in UMTS networks so far in 3GPP, although some solutions have been agreed in Release 9. Therefore it is proposed to start an initial study phase to identify solutions and perform any initial evaluation, such that a subset of these proposals can be used as the basis for further investigation of their feasibility. The objective is to do an initial study to identify potential solutions to enable energy saving within UMTS Node-Bs, and do light initial evaluation of the proposed solutions, with the aim that a subset of them can be taken forward for further investigation as part of a more focused study in 3GPP. Some initial indication of these aspects in relation to the proposed solutions should be provided. The power efficiency in the infrastructure and terminal should be an essential part of the cost-related requirements in LTE-A. There is a strong need to investigate possible network energy saving mechanisms to reduce CO2 emission and OPEX of operators. Although some solutions have been proposed and part of them have been agreed in Release-9, there has not been a large amount of attention on energy saving for E-UTRAN so far. 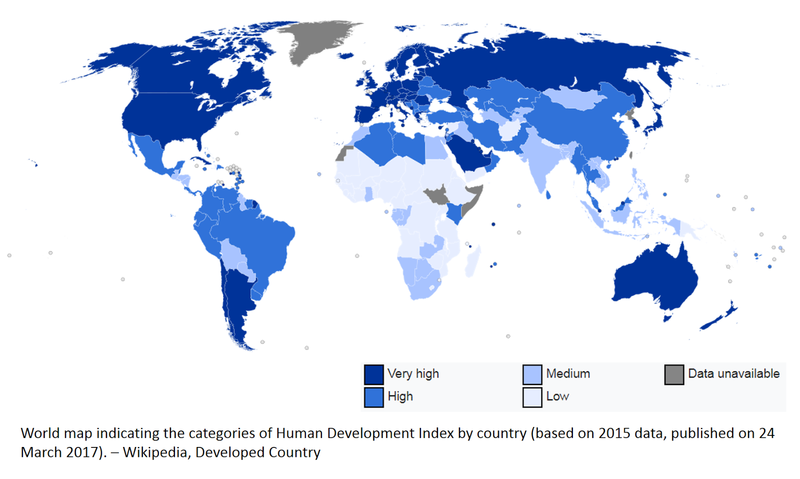 Many potential solutions are not fully shown and discussed yet. Therefore, it is proposed to start an initial study phase to identify solutions, evaluate their gains and impacts on specifications. Intra-eNB energy saving, in EUTRAN network, a single cell can operate in energy saving mode when the resource utilization is sufficiently low. In this case, the reduction of energy consumption will be mainly based on traffic monitoring with regard to QoS and coverage assurance. A lot of work on Inter-eNB energy saving has already been done for both LTE and UTRA in Rel-9. This Study Item will investigate additional aspects (if any) on top of what was already agreed for R9. Inter-RAT energy saving, in this use case, legacy networks, i.e. GERAN and UTRAN, provide radio coverage together with E-UTRAN. For example E-UTRAN Cell A is totally covered by UTRAN Cell B. Cell B is deployed to provide basic coverage of the voice or medium/low-speed data services in the area, while Cell A enhances the capability of the area to support high-speed data services. Then the energy saving procedure can be enabled based on the interaction of E-UTRAN and UTRAN system. The objective of this study item is to identify potential solutions for energy saving in E-UTRAN and perform initial evaluation of the proposed solutions, so that a subset of them can be used as the basis for further investigation and standardization. RAN2 will focus on the Intra-eNB energy saving, while RAN3 will work on Inter-RAT energy saving and potential additional Inter-eNB energy saving technology. There has not been a large amount of focus on energy-saving in GSM/EDGE networks so far in 3GPP, although some solutions have been agreed in previous Releases, notably MCBTS. Therefore it is proposed to start an initial study phase to identify solutions and perform any initial evaluation, such that a subset of these proposals can be used as the basis for further investigation of their feasibility. • And any other radio interface impacted power reduction solutions. • Impacts on legacy and new mobile stations implementation and power consumption, e.g. due to reduction in DL power, cell (re-)selection performance, handover performance, etc. Solutions shall be considered for both BTS energy saving non-supporting and supporting mobile stations (i.e. solutions that are non-backwards compatible towards legacy mobile stations shall be out of the scope of this study).